I'm a pretty notorious stasher of patterns. When I see a pattern that looks interesting, I'll buy it and save it for the right fabric at the right time. It turns out that it was the right time to pull out a pattern that I've been sitting on for the last 2 and a half years. Yikes! So, the pattern that I'm reviewing today is the Slicker Tote by Joan Hawley of Lazy Girl Designs. 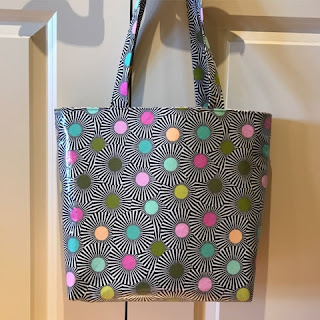 It's a pretty straightforward tote that uses a nifty iron-on vinyl product, Slicker, that you apply to laminate the exterior fabric on the bag. Slicker doesn't add a lot of thickness to the fabric, and it remains very flexible. The pattern also recommends using Stiff Stuff, a firm sew in interfacing, to give the tote body while still remaining lightweight (and it doesn't feel stiff). I've used it in several projects, and I'm a big fan. 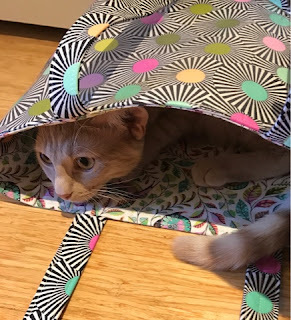 Stiff Stuff helps this tote to stand on its own. One of the reasons that I haven't made the pattern was that I was a little afraid of the Slicker. Seriously. Now that I've made it, I feel a little bit silly because it was really easy to apply. If you have you ever tried to put a screen protector on a phone? That sort of terror filled, nightmare experience? Yeah, that's what I was envisioning. It was even easier than standing there watching the guy at Best Buy put the screen protector on my phone for me after I shelled out the cash. The hardest part was trying to make sure that I didn't have any fuzzies / thread bits that got sandwiched in between the fabric and the Slicker because I'm pretty finicky about that type of stuff. There actually is a little piece of fuzz under it, but you can't easily see it unless you know where to look. Oops. You can see the glossy finish that Slicker gives to the fabric. Another reason that I haven't made the pattern was that I have a pretty big (and well documented) weakness for fabric that has a very definite directional print which is not ideal for this project. Tula Pink's new Slow & Steady collection has several prints that I love and actually are not directional. Perfect! Road block eliminated. 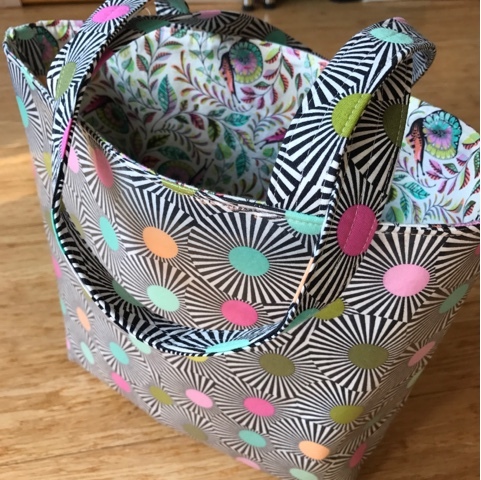 In Joan's typical style (I think this is the 6th pattern of hers that I've made), the pattern uses photographs to illustrate the steps. The written instructions are also clear, and they include information on how to apply the Slicker. For construction, I did opt to use my machine's Teflon / non-stick foot for part of the process. I really don't think it was necessary, but I already have one so I figured that I might as well use it. With simple straight seams, this pattern is rated for a Confident Beginner, and I would agree with that. While laminated fabric isn't totally waterproof (you are stitching through it which means that you are putting holes into it), it's generally pretty water resistant which is a big bonus for me living in the rainy Pacific Northwest. It can also be wiped clean. To be completely honest, the biggest issue that I had making the bag was that I almost pressed the Slicker with my iron directly on the fabric (you can press it from the WRONG side of the fabric without worry on medium heat with no steam). That's a pretty big no-no for laminated fabric. The problem wasn't with the pattern (which is very good about reminding you to use the paper backing of the Slicker as a pressing sheet). It was totally me. 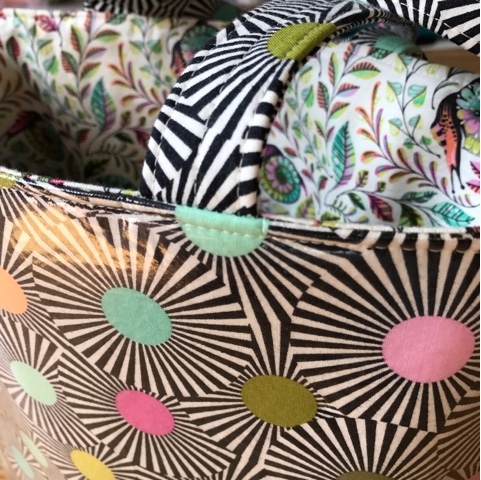 One of my favorite things about this pattern is that using the Slicker product means that I can grab just about anything from my stash of quilting cotton. Buying pre-laminated cottons are often expensive and offer a significantly more limited selection. So, making my own is a great option. Overall, I think this was a great pattern. It's well written, and it is a nice introduction to Slicker, Stiff Stuff, and Lazy Girl patterns. I was not asked or paid to write this review. As always, my opinions are my own.